Draft: 2007, Boston Red Sox, 11th rd. Attended Carrollton American Heritage Academy for his first three years of high school and starred as a pitcher and shortstop, leading the conference in 23 different offensive categories...for his senior year, transferred to Marcus High School, which is in Flower Mound, TX, a suburb of Dallas...Played baseball and football (defensive back) at Marcus HS, where he graduated from in 2011... was tackled and suffered a torn ACL during senior season, ending football career...received a scholarship to play baseball at Texas Tech but elected to play professional baseball after being drafted by Boston in the 11th round of the June 2007 draft...signed by Red Sox scout Jim Robinson...Played five seasons (2008-12) in the Red Sox minor league system before being selected by Minnesota in the 2012 Rule 5 Draft...was selected fourth overall, three picks after the Astros selected RHP Josh Fields first overall...Was arbitration eligible for the third and final time this offseason...signed a one-year deal for the 2019 season on Jan. 11, 2019...is eligible for free agency following the year. 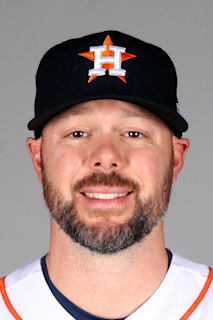 Was one of the most electric relievers in the game in what was his sixth Major League season...split his season between the Twins and Astros and combined to lead the AL with 77 appearances, which ranked tied for third in the Majors...posted a career-best strikeouts per 9 innings ratio (12.80), which ranked ninth in among AL relievers... ranked fourth among AL relievers in strikeouts (101) and eighth in ERA (2.54)...set career highs in appearances and strikeouts...started the season on the Twins Opening Day roster...was acquired by the Astros on July 27 in exchange for two prospects: RHP Jorge Alcala and OF Gilberto Celestino...in his 26 games with Houston, posted an 0.77 ERA (2ER/23.1IP) with 32 strikeouts, three walks and just 11 hits allowed (.138 opponent batting average) ...ended the season on an active and career-long 21-game scoreless streak (18.0 IP)...was the third-longest active scoreless innings streak in the Major Leagues...was the sixth-longest scoreless appearance streak in Astros history...pitched in five games in the postseason, posting a 1.80 ERA (1ER/5IP) with seven strikeouts and one hit allowed...marked his firstcareer postseason appearances...entered the Game 1 of the ALDS vs. CLE in the 6th inning with the bases loaded and one out in what was his first career postseason appearance...threw a wild pitch on his first pitch to allow a run to score...induced a ground ball and fanned Edwin Encarnacion to end the inning...returned to the mound and worked a scoreless 7th inning...recorded holds in each of his first three postseason appearances, Games 1 and 2 of the ALDS vs. CLE, and Game 1 of the ALCS at BOS. Made Twins Opening Day roster for second time in career and first since 2013; spent entire season with Twins. Posted a 1.98 ERA (13.2 IP, 3 ER) with one walk and 14 strikeouts in 14 June games. Held opponents scoreless in 50 of 72 appearances. Set career-highs in games (72), innings pitched (75.1), wins (6) and strikeouts (67). Held left-handed hitters to a .252 (30-for-119) average, compared to .275 (49-for-178) for right-handers. Posted an ERA of 2.41 (37.1 IP, 10 ER) in 37 home games, compared to 4.97 ERA (38.0 IP, 21 ER) in 35 road games. Struck out multiple batters in 19 games, including tying his career-high of four, April 24 at Washington. Led Twins in games (72) and holds (14) and tied for third in wins (6). Ranked fourth in AL in relief innings pitched (75.1) and tied for fourth in games (72). Optioned from Twins spring training to Triple-A Rochester March 21. A Appeared in seven games for the Red Wings and was recalled by Minnesota May 1 when Tim Stauffer was placed on disabled list....Earned win in his first appearance, tossing a season-high 2.2 scoreless innings May 3 vs. Chicago-AL....Posted 2.84 ERA (12.2 IP, 4 ER) in 12 June games...Did not allow a home run on the season, one of two pitchers in baseball with a minimum of 25.0 innings pitched to not allow a homer, St. Louis' Adam Wainwright being the other....Placed on 15-day disabled list July 6 with right lat strain and did not return...transferred to 60-day disabled list August 3 when the Twins selected contract of Tyler Duffey from Rochester. Optioned from Twins spring training to Triple-A Rochester March 24...Posted a 2.04 ERA (17.2 IP, 4 ER) with one save in nine May games...Recorded at least one strikeout in 24 straight games April 26-July 8, fanning 45 in 42.1 innings during that time...Did not allow a home run in first 25 appearances (43.0 IP) April 6-June 20; first home run allowed was to Jose Pirela June 24 at Scranton/Wilkes-Barre...Converted six of seven save opportunities for the Red Wings...Recalled July 24 and spent rest of season with Minnesota...Eight of first nine appearances for the Twins were scoreless July 24-August 15, posting a 0.75 ERA in that span...Combined to go 3-4, 2.94 ERA (88.2 IP, 29 ER) with 29 walks and 77 strikeouts in 60 games between Rochester and Minnesota. Made Twins Opening Day roster, his first with a major league club. Made major league debut April 4 vs. Detroit, tossing 1.0 scoreless innings with one hit allowed and one strikeout. Earned first major league win May 8 at Boston, tossing a career-high 4.0 scoreless innings with two hits allowed. Did not allow a home run in first 23 appearances (34.0 IP) April 4-June 22; allowed first home run June 26 at Miami to Placido Polanco. Posted a 1.20 ERA (30.0 IP, 4 ER) in first 21 games April 4-June 14 with opponents hitting .200 (22-for-110) ... posted ERA's of 1.69 (10.2 IP, 2 ER) in seven April games and 1.10 (16.1 IP, 2 ER) in 10 May games. Appeared in 49 games, tied for eighth most for a rookie in club history; pitched 76.2 innings, sixth most for a rookie reliever in club history. Ranked 10th among AL rookies in innings pitched, first among relievers - third among all MLB relievers ... tied for fifth among AL rookies in appearances. Started season with Single-A Salem (Boston). ... 12 of first 13 appearances were starts; overall went 4-3, 5.85 (60.0 IP, 39 ER) in 12 starts and 1-0, 7.88 (16.0 IP, 14 ER) in eight reliefappearances for the Salem Red Sox. ... Promoted to Double-A Portland July 15. ... Seven of final 10 appearances were scoreless July 29-September 2, posting a 1.86 ERA (19.1 IP, 4 ER). ... Held right-handed batters to a .190 batting average (11-for-58) and left-handed batters to a .293 batting average (12-for-41) for the Sea Dogs. ... Combined to go 7-5, 5.38 (103.2 IP, 62 ER) with 36 walks and 82 strikeouts in 34 games (12 starts) between both levels. ... Pitched for Surprise Saguaros in the Arizona Fall League, going 0-0, 3.86 (14.0 IP, 6 ER) with one save, one walk and 18 strikeouts in 10 games. ... Selected by Minnesota in the major league phase of the Rule 5 Draft (4th overall) December 6, 2012. Spent entire season with Single-A Salem...went 3-0, 2.33 (19.1 IP, 5 ER) in four April starts...tossed at least 5.0 innings in 17 of 26 games...tied for first in Carolina League in starts (26)...led Salem in innings pitched (130.0). Spent entire season with Single-A Greenville...held opponents to three runs-or-fewer in 22 of 24 starts, including 11 straight from July4-August 30, going 3-1, 2.56 (59.2 IP, 17 ER) in that span...tied for second on the club in starts (24)...ranked seventh among Red Sox minorleaguers in ERA (3.72). Spent entire season with Single-A Lowell...went 3-0, 0.84 (21.1 IP, 2 ER) in first four starts June 22-July 8...ranked first on the club instrikeouts-per-9.0 IP (9.65)...tied for first on the club in strikeouts (64) and tied for second in wins (6)...made one playoff appearance, allowingone run in 3.0 innings pitched. Spent first professional season with GCL Red Sox, going 1-4, 3.79 (40.1 IP, 17 ER) in 10 games (9 starts)...went 0-4, 4.21 (36.1 IP, 17ER) in his nine starts. July 1, 2017 Minnesota Twins recalled RHP Ryan Pressly from Rochester Red Wings. June 17, 2017 Minnesota Twins optioned RHP Ryan Pressly to Rochester Red Wings. June 13, 2017 Minnesota Twins recalled Ryan Pressly from Rochester Red Wings. June 1, 2017 Minnesota Twins optioned RHP Ryan Pressly to Rochester Red Wings. November 2, 2015 Ryan Pressly roster status changed by Minnesota Twins. August 2, 2015 Minnesota Twins transferred RHP Ryan Pressly from the 15-day disabled list to the 60-day disabled list. Right lat strain. July 6, 2015 Minnesota Twins placed RHP Ryan Pressly on the 15-day disabled list retroactive to July 5, 2015. Right lat strain. May 1, 2015 Minnesota Twins recalled RHP Ryan Pressly from Rochester Red Wings. March 21, 2015 Minnesota Twins optioned RHP Ryan Pressly to Rochester Red Wings. July 24, 2014 Minnesota Twins recalled Ryan Pressly from Rochester Red Wings. March 24, 2014 Minnesota Twins optioned RHP Ryan Pressly to Rochester Red Wings. December 6, 2012 Minnesota Twins claimed Ryan Pressly off waivers from Portland Sea Dogs. September 4, 2012 RHP Ryan Pressly assigned to Surprise Saguaros. July 15, 2012 Ryan Pressly assigned to Portland Sea Dogs from Salem Red Sox. June 8, 2012 Ryan Pressly roster status changed by Salem Red Sox. April 1, 2011 RHP Ryan Pressly assigned to Salem Red Sox from Greenville Drive. June 5, 2010 Ryan Pressly roster status changed by Greenville Drive. May 31, 2010 Greenville Drive placed RHP Ryan Pressly on the 7-day disabled list retroactive to May 27, 2010. April 5, 2010 RHP Ryan Pressly assigned to Greenville Drive from Lowell Spinners. August 14, 2009 Ryan Pressly roster status changed by Lowell Spinners. August 6, 2009 Lowell Spinners placed RHP Ryan Pressly on the 7-day disabled list. June 16, 2009 RHP Ryan Pressly assigned to Lowell Spinners from GCL Red Sox.